I spent the day at home, nursing a cold. You know when you think you are feeling better and then you try to do something (for me it was a bit of work on the laptop) and you realize you should've stayed in bed. Well, it was one of those days. I finally got out of bed at 4:30pm. One thing you should know about me is I have to keep my hands moving all the time - even when I am sick. It became the perfect time to sit and work at a hobby. I have a few. I put the Christmas music, grabbed my needle and some wool and voila! Homemade felted Christmas ornaments. Like I said I have a few hobby - some require a lot of concentration, like the doll making. 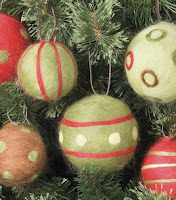 But felting is mindless and a great way to release some tension. Jabbing wool with a very sharp needle until it takes form. It's easy and quite enjoyable. Someday I hope to play around a bit and really see what I can create with a bit of canvas and bits of wool. For now, my skill is limited to embellishments, birds and Christmas ornaments.